Sometimes the neatness with which a minor historical moment lines up with today’s world is hard to ignore. The article on the left is a throwaway item from the front page of the Sunday New York Times, published April 12, 1914. It was probably more appropriate to a society page, but editors have always scrambled to fill space with meaningless content. 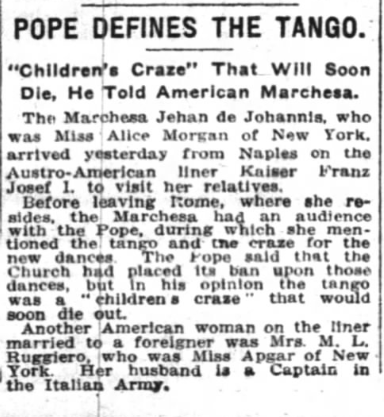 This particular meaningless filler came from an American who’d apparently married into nobility (see Downton Abbey for a noted fictional example of the same) but still wasn’t above finding a way to brag about meeting Pope Pius X and discussing with him the favorite obsession of moral scolds of the day, the dastardly dance craze known as The Tango. As you see in the article, the Pope noted that the Church had banned the dance and that it was a “children’s craze” that would fade away. Like heelies and blinking lights on shoes, or The Marijuana, I guess. Pope Pius X would soon die and be replaced by Benedict XV. The tango, which had been around since the 1890s, would endure and become a beloved part of South America’s cultural heritage, particularly in Uruguay and Argentina–which is, funny enough, where the current Pope, Francis, was born, in 1936. What does the current Pope think about the tango? Apparently, he’s perfectly okay with it.